The AeroTab Master Kit offers unlimited options for mounting a tablet just about anywhere imaginable including a tripod leg, lightstand, and more. The Case Air Power Split Cable lets you recharge and power the Case Air while simultaneously using it for shooting. The Case Air Power Split Cable features a male USB-A plug that can be used with any standard external USB battery pack or USB wall power adapter. Perfect for those long wireless shoots or charging Case Air on the fly without shutting down your wireless tethered session. This kit makes it easy to mount a tablet on any pole or flat surface from 0.5″ to 2.1″ in diameter. The whole system stores compact for easy transport, so you can take and use your tablet in any situation. 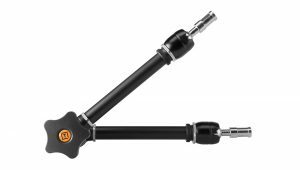 The kit includes an AeroTab Universal Tablet Mounting System, Rock Solid Master Clamp, and Rock Solid Master Articulating Arm. Once the tablet is placed in the diagonal extension, slide the non-slip, scratch proof corners onto the tablet for a snug fit. Tighten the AeroTab by turning the bracket. Then attach the AeroTab to the Master Articulating Arm. Mount the Articulating Arm with attached Master Clamp onto a tripod leg, lightstand, table, etc. then move the arm to position the tablet in the ideal position, finally use the tightening knob to ensure the kit is secure.